In an effort to keep all NARI members and prospective members on the same page, we have created a weekly newsletter that is emailed every Friday at 7:00 am. This newsletter typically has 3 to 4 news articles, a section for events happening that week and a monthly overview. We hope that this will provide a consistent source for NARI Atlanta information. Head to your Profile in your Member Compass and under Newsletter Opt, select Yes. Don't forget to save at the bottom of your Profile! The newsletter contains a good bit of links to our website, the national website, and various other credible sources. Due to the amount of links in it, it generally triggers spam filters unless you add the sender email to your contacts. NARI Atlanta is planning to release a newsletter for homeowners. Stay tuned for details! The NARI Atlanta membership directory is printed each January with over 200,000 combined digital and print copies shared with consumers, suppliers, lenders, media, architects, interior designers and other related businesses. 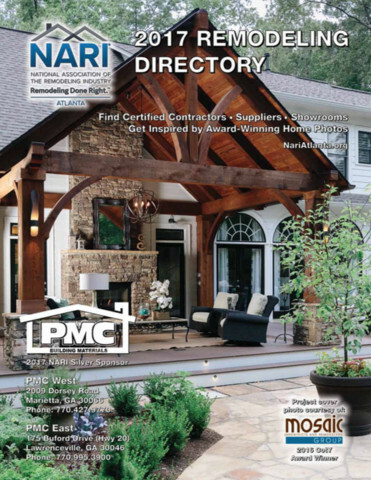 Consumers may pickup a copy of the directory in the January issue of Atlanta Home Improvement Magazine, at all Atlanta Home Shows, or by calling or emailing the NARI Atlanta office.